Classy-looking laptop that's a little pricey. Decent performance; Looks good; Ergonomic keyboard. After laying low for a really long time, Toshiba is back with a bang into the India laptop with 18 new devices. Of the stylish and high performance notebooks meant for every price segment, the company has got the trendy L Series meant for the youth, with high-gloss luxury finish and Onkyo speakers. The slim Satellite L40-A I0110 with a 14" screen is powered by an Intel Core i3 CPU and packs in a huge 750 GB hard drive. Let's take a look. 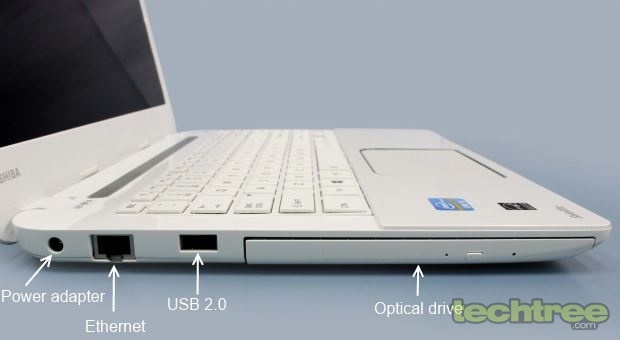 The first thing that we noticed about the Toshiba Satellite L40-A I0110 is its pearl white plastic casing with thin stripes that looks good, though it might tend to get a bit dirty with use. With a thin profile of just 24 mm and weighing less than 2 kg, this device almost competes with Ultrabooks. The lid opens to around 120°, while the hinge is quite stiff and rigid, thus capable of holding the screen at any angle. The build quality is also not bad, but not remarkable either. The 14" screen has pixel dimensions of 1366x768. It has a glossy mirror finish that reflects everything, but is remarkably resistant to smudges and fingerprints. There is an HD webcam at the centre of the top bezel along with stereo microphone pores on either side to facilitate video chat. The island-type keyboard has well-spaced keys. The Caps Lock key has an LED status indicator and the power button has a white LED ring that glows white when powered on. The keys are not backlit and there is no separate numeric keypad due to obvious size constraints. The function keys have additional functions, which can be activated using the FN key modifier. The touchpad is of ample size, and present slightly on the left to reduce the chances of accidental touch inputs from the palm while typing. Of course, you also have the option to switch off the touchpad. The Onkyo speakers are placed under the perforated metallic strip that is between the hinge and the keyboard. 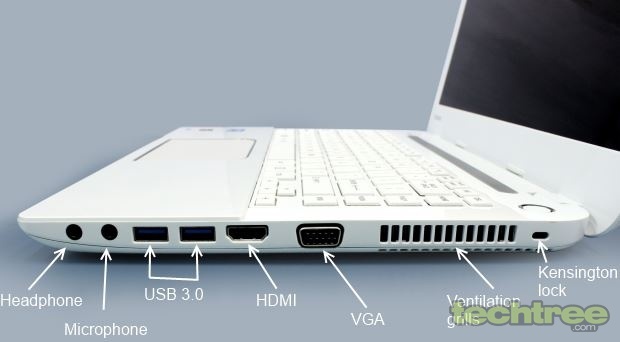 There are ports on either side of the laptop. The right side has the most number of ports starting with the headphone, microphone, two USB 3.0, HDMI-Out, and D-Sub (to connect to legacy devices and projectors). There is also a Kensington Lock to physically secure the laptop against theft. Ventilation grills are also present here. The left side has a Gigabit Ethernet port and a USB port in addition to a tray-loading DVD-RW drive. The underside of the laptop has a number of grills for air intake. The RAM can be upgraded via the underside removable panel. 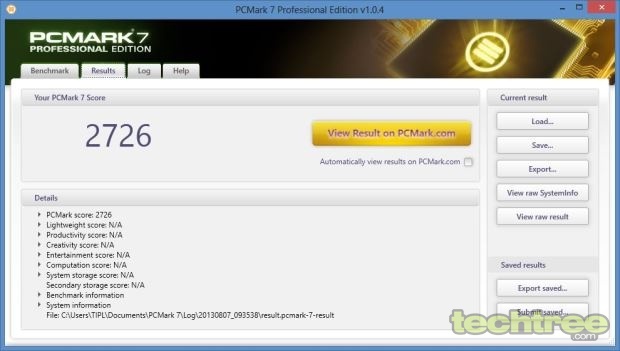 The I0110 is powered by an Intel Core i3-3227U dual-core CPU clocked at 1.9 GHz. The 4 GB of RAM seems to be adequate, although some of it is reserved for the on-board graphics. Storage is taken care of by a generously sized 750 GB hard drive. Graphics is handled by the integrated Intel HD Graphics 4000. Windows 8 Pro comes preloaded with MS Office 365 with only a 30-day trial. Your data is protected by Norton Internet Security that comes pre-installed. The Satellite L40-A I0110 boots up in around 15 seconds. This is normal for a laptop with a hard drive instead of an SSD. The performance is good in general office tasks, but we noticed some slowdown when tasked with several applications at once with the antivirus running in the background. The screen produces good colours and the viewing angles are also good. However, the glossy finish makes it difficult to view it with a light source behind the user. As mentioned earlier, the screen doesn't get smudged much. The keyboard is really comfortable to use and the reassuring firm feedback of the keys makes it a joy to type on. It would have been nice to see a backlit keyboard to make it more usable in dark environments. While the touchpad is large, it is somewhat erratic when it comes to touch response. Speakers are loud enough to be used without having to plug in headphones. The audio clarity is good and is mainly tuned towards human speech for clarity of dialogues while watching movies or serials. 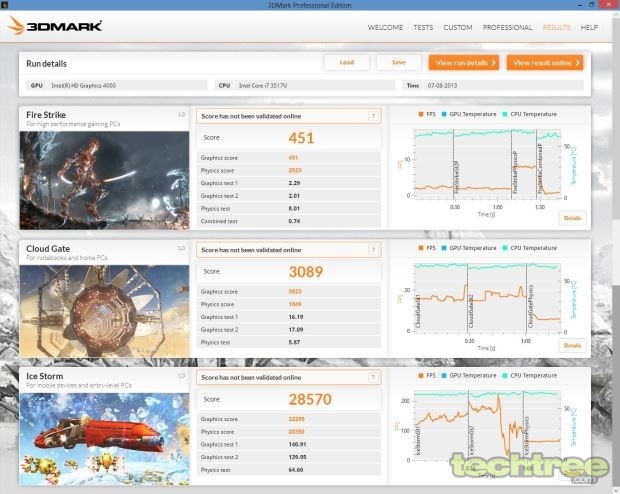 We ran a few benchmarks on the laptop to find out how well it fares. 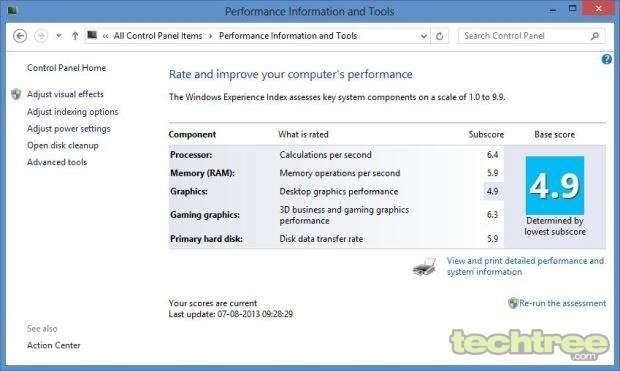 The results indicate a laptop with a good office performance. The Intel HD 4000 graphics is only good enough for casual gaming and office tasks. It also doesn't have any problem handling playback of 1080p movies. However, the lack of a dedicated graphics card, you shouldn't expect too much on the serious gaming front. During the entire duration of our review, the laptop ran cool and at the most got moderately heated. We measured the battery life by Battery Eater Pro and by actually using the laptop with the Balanced power scheme of Windows 8. The two tests run in Battery Eater Pro utility are the Reader's test which simulates real-world reading scenario, while the Classic test uses OpenGL rendering to simulate heavy usage such as gaming. Please note that the battery backup times logged in this way are the least that are possible in the two tests due to the maximised power consumption. You can always expect better backup times in real world usage. A battery backup time of 1 hours 50 minutes was registered in the Classic test, while the Reader's test result yielded 3 hours 45 minutes. In normal usage that involves using office applications, surfing the internet, occasional music and video, and watching some YouTube clips, the battery lasted for over 4 hours 30 minutes with the Power saver scheme. This is a dismal battery backup for the Windows 8 laptop with a power-efficient Intel Core i3 CPU. The Toshiba Satellite L40-A I0110 exhibits good overall performance. It looks good and the build quality is also not bad. Its light weight and thin profile makes it ideal to carry around. The multimedia performance is good, thanks to a nice screen, Onkyo speakers, and 1080p movie playback capability. There are ample number of ports too. If there is one area to complain about, it is the rather dismal battery life as it could have been better, considering its low-power consuming components. The Toshiba Satellite L40-A I0110 is priced at Rs 38,710. This pricing seems to be a bit on the higher side even after considering that it comes with a 750 GB hard drive, because there are several other alternatives available for similar price such as the HP Pavilion 14-B003TX Sleekbook with a 1 GB GeForce 630M or the Lenovo Essential G400s with a 10-point capacitive touchscreen. If you want to save some cash, you can even go for the Dell Vostro 2420 for around Rs 6000 less.